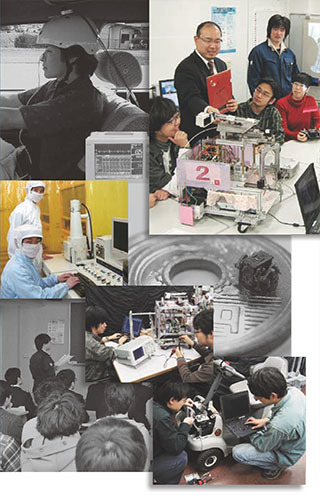 Based on mechanical and electrical engineering, the department of Precision Machinery Engineering provides academic programs in order to enable students to become creative scientists and engineers, who can challenge advanced technologies and automated systems represented by mechatronics, robotics and microelectromechanical systems (MEMS). In modern mechanical engineering fields, research focuses have rapidly shifted from traditional machines to complex and multifunctional systems. Recent manufacturing technologies are supported by intelligent digital engineering, fine machining, microfabrication, and IT processes. In order to control and operate these latest mechanical systems, it is required that various physical values (length, mass, temperature and so on) and images of objects must be measured with the highest accuracy using high precision sensors and high performance electronic circuits. In the near future, such advanced research subjects on these systems will be implemented with self-learning functions, and interfaces between advanced machines and human beings. The programs have been provided for students to acquire fundamental skills to work on these advanced mechanical systems. The course curriculum is composed of mechanics, electronics, system engineering and instrumentation, control and ergonomics, and microsystems. Additionally, the students will have opportunities to apply their academic skills in various graduation research projects under the supervisions of their professors. The Research Center for Micro Functional Devices with advanced microfabrication facilities in a clean room was established in 2005. The students can perform the latest researches on MEMS at this center. Over the years, our graduates have been successful in numerous fields, and they are highly acknowledged in their various institutions such as governmental organizations, leading industries and academic institutes.